And the key of the house of David will I lay upon His shoulder; so He shall open, and none shall shut: and He shall shut, and none shall open (Isaiah 22:22). We are now in the time of Isaiah 22:22 where the Lord is releasing the authority to empower, impart, and equip a company of people with the keys of the Kingdom. These keys unlock the door of the Kingdom of God within His people that will enable them to rule with dominion under an open heaven with the authority of Christ the Lion. The Lord is now mobilizing a Davidic company of prophetic people that will rise and shine with His glory to manifest destiny by those that have a passion for His presence. As Isaiah 22:22 declares, the key of the house of David will be upon the shoulders of Christ. It is through His victory at Calvary that we have received the keys of the Kingdom of heaven that He promised to His disciples. (See Mt. 16:19) Jesus is the doorway for His people to walk in the light of His Kingdom to fulfill their destiny. Sitting at the right hand of the Father far above all principalities and powers, and every name that is named, the door of our destiny to rule with Christ being clothed in His glory cannot be shut by anyone. To those that respond to the call are given the keys to rule with Christ. This is the Isaiah 22:22 Company of prophetic people that are “…the manifestation of the Sons of God (Ro. 8:19). These are the Kings and Priest of the Royal Priesthood being raised up today to rule in the midst of their enemies. They have the keys to open the doors of destiny to initiate progress and insure success that others cannot. They have the keys to open prison doors that set the captives free with the keys to build His church and “the gates of hell shall not prevail against it” (Mt. 16:18. The key of the house of David combines the priestly anointing to access the realms of heaven with the Kingly anointed to rule at the gates on earth. King David was the first to combine the priestly anointing to minster unto God to access heaven to obtain the divine wisdom and counsel that enabled him to rule as King on earth. This is the original plan that God ordained for mankind, which is to be clothed in the light of His glory after His image to rule on earth with the blessing to “Be fruitful, and multiply and replenish the earth and subdue it, and have dominion…” (Ge. 1:25). Mankind was created to rule on earth with dominion under the authority of God in heaven. The church is “a chosen generation, a royal priesthood” (1 Peter 2:9) with the call to walk with an open heaven to have dominion on earth. It is the prayer of Jesus for “Thy Kingdom come, thy will be done on earth as it is heaven.” In every Kingdom, there is a King for Kingdom means, the Kings’ domain. The dominion of the Kingdom of God is realized when that which is taking place in heaven is realized here on earth. Adam and Eve were created in God’s image clothed in light to rule on earth with an open heaven. The focus now, however, is to expose and undo the works of the devil. The call is to arise and shine for your light has come to usher in the glory of the presence of the living God for heaven to be revealed on earth. Even in the midst of the greatest darkness God will raise up a remnant that shine with the light of His glory (Is. 60:1-3). Jesus prayed to the Father that the same glory that the Father had given to Him would also be given to His disciples “that we may be one even as we are one” (John 17:22). Think of it! The entire splendor of heaven is our inheritance in Christ. It is His glory – the realm of the Kingdom of heaven which comes in His presence. The territory that God has assigned to you is your domain that you have the authority to rule as a Royal priesthood to occupy, prevail and prosper under an open heaven. It is within your sphere of influence that the nature of heaven itself and all of its splendor and glory can be realized that reveals the Lordship of Christ on earth as it is in heaven. Jesus declared, “All authority has been given to Me in heaven and on earth. Go ye therefore….” (Mt. 28:19—19) Jesus redeemed the original plan God established that man gave away to Satan when he fell due to sin. Jesus took it back as the second Adam and now proclaims, “Go and take your territory for you were created to rule with dominion under the authority of Christ your King!”It is from the throne of triumph that Jesus declared that your inheritance as a citizen of His Kingdom is to go forth and reclaim the land and prevail for “we are more than conquerors through Him that loved us” (Ro. 8:37). Now thanks be unto God, which also causes us to triumph in Christ, and makes us manifest the savor of His knowledge by us in every place” (2 Cor. 2:14). It is the call of every believer to rule as a joint heir with Jesus to have dominion in the territory that God has assigned to them. Whatever the mountain is, whether it is the family, business, property or investments, you have been called to prosper, be fruitful and multiply, to subdue and rule with dominion as a citizen of the Kingdom of heaven. Christ is giving keys to the mother and fathers of the faith to unlock the Kingdom of God in others that will enable them to make a great advance. God desires to unlock the Kingdom in His people to bring forth the Kingdom of heaven through His people. The keys that God is releasing will also bring about change in leadership, church structure and the true identity of His people that will lead to new realms of glory. Change will take place as God’s people are established in their true identity to posses their ordained inheritance as sons and daughters of the King as citizens of His Kingdom. These keys unlock the prison doors that hold people captive to walk in the spirit of freedom and liberty. The apostle Paul tells us “Now the Lord is that Spirit: and where the Spirit of the Lord is there is liberty (2 Cor. 3:17). When you received the gift of salvation did you not receive the spirit of Christ into your heart? Does not the scriptures declare that the Spirit bears witness with our spirit, that we are the children of God and joint-heirs with Christ? (See Ro. 8:15-16) What is coming is a revelation of our inheritance as the saints in light as citizens of the Kingdom. Giving thanks unto the Father, which has made us be partakers of the inheritance of the saints in light. Who has delivered us from the power of darkness, and has translated us into the Kingdom of His dear Son” (Col. 1: 12-13). The eye of the Father is upon His people to reveal their true identities that literally unlocks them to become who they are created to be. The Kingdom of heaven is our home and our inheritance that is to be revealed on earth. We have witnessed the power of transformation by some basic teaching that we give in regards to the truth that we are a spirit with a body created by God who is a Spirit. Those who realize who they really are – a spirit created in His image, have a whole new mindset that enables them to experience the reality of the presence of God and His Kingdom. We were created for our spirit to be in heavenly places while our bodies are on earth. When the spirit of a man connects with His creator who is a Spirit, the spirit of a person comes alive with the Spirit of God. It doesn’t matter how long they have been a Christians, this experience “shifts” them from the natural to the supernatural realm before your very eyes. As their spirit is released to the throne of God, the light, life and glory of God touches them and awakens them to their destiny. This experience is life changing. What takes place is an infusion of the light, life and love of God that remains with them. You can see the light come into their eyes as their countenance changes. In other words, they own it and as they walk in His light, His glory becomes their spiritual reality not just a Biblical theology. God is raising up mothers and fathers with the key to awaken hearts that will enable them to see who they really are so they can from their place of true identity, step into the place of their purpose with Kingdom authority. It is only when the eyes of our hearts are opened to see how God has created us in His image and positioned us as citizens of the Kingdom that we can understand who we really are. Our true identity is not in what we do, but in our being! Who we are is more important than what we do! If you desire to serve God with your spirit (Romans 1:9) and walk as a son of light with the desire to have the kingdom of God unlocked in you, please attend one of our monthly Key of David worship sessions that we host on the last Sunday of each month at Hills Mansion in Augusta, Maine For more information about the Key of David Ministry times and locations, please click here. “Lions heart” anointing that is empowering the knights of Christ to prevail in battle. It was during the Harvestfest Conference at MorningStar Ministries that my ministry assistant, Lisa Richards, discovered the art work that you see in this writing. When she showed the painting to me I instantly knew that this art represented the vision that I had for over 20 years for the emerging Davidic Company of radical worshipping warriors. Amos 9:11 declares that in the last day the Lord will raise up the tabernacle of David that is fallen, a tabernacle for the Spirit of God where those that seek after the Lord will come and worship from all nations. A house of worship made of living stones, a prophetic people that are lovers of God with the heart of David. A people of the Royal Priesthood empowered with the authority to access the realms of heaven to rule at the gates on earth. 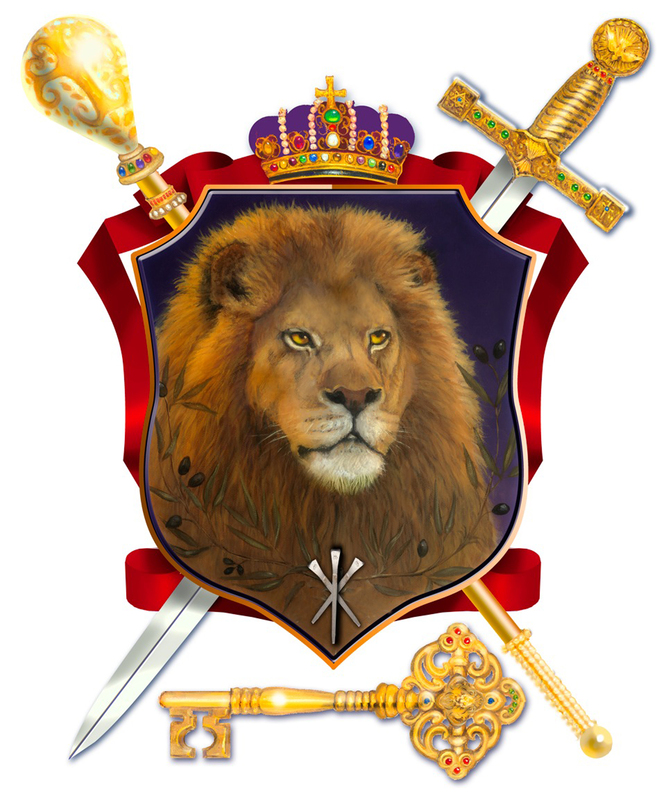 This artwork is now our official shield that represents our “Key of David” worship and praise ministry, which also has the face of the Lion. Judah means praise. The Lion of Judah will also be roaring through a prophetic people that are joyful in their King. (See Psalms 149) As the tabernacle of David is restored, like the worship service noted in 2nd Chronicles 5:13-14, as the trumpeters and singers make one sound to be heard in praising the Lord with instruments of praise, the house of the Lord will be filled with the glory of the Lord. The sound of Christ the Lion of Judah will roar that will open prison doors, heal the broken hearted, raise the dead and set the captives free. And like the victory by Israel noted in 2 Chronicles 20:21-22, as the company of worshipping warriors march before the army of the Lord singing praises unto the Lord, the Lord will go before them to set ambushes to smite their enemies. Instead of being ambushed, the body of Christ is about to witness the slaughter of their enemies by the King of glory. “ Who is this King of glory” The Lord strong and mighty, the Lord mighty in battle. Who is this Kind of glory? The Lord of hosts, He is the King of glory (Psalms 24:8-9). Get ready for impartations this year that will unlock your destiny. Get ready to hear the Lions roar with the authority to unlock the Kingdom of God in you that will set you free to be who you were created to be in His image. Get ready to receive the keys that will unlock the Kingdom of God in you that will enable you to manifest destiny to rule with dominion under an open heaven. Get ready to receive an impartation of the authority of Christ the Lion.